Skelmanthorpe Training Band at Pilling Lane Summer Fair on July 20th 2013,played a programme of easy-listening, foot-tapping music to residents and visitors who enjoyed an afternoon of lovely summer sunshine and brass music. 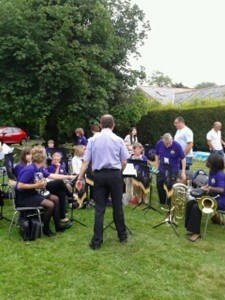 During the interval the younger members of the band had a ‘smashing’ time on the crockery shy while the more senior members contented themselves with tea and cakes. This entry was posted in News-All, Skelmanthorpe Training Band. Bookmark the permalink.